Technological advancements in accumulators, welders, and tube cut-offs has resulted in dramatic increases in welded tube mill production speeds. A new or upgraded tube mill can run nearly twice as fast as was possible just a decade ago. The challenge that tube makers face today is not how to increase mill speeds, but how the finished tubing can be gotten away from the mill and packaged as fast as the mill can produce it. In the past, handling and packaging was typically done by manual labor, but because of the high production capability of modern mills, man handling tubing often results in reduced mill speeds, additional manpower, and increased incidences of workplace injuries. Modern tube making technology has simply overrun old manual tube handling practices. 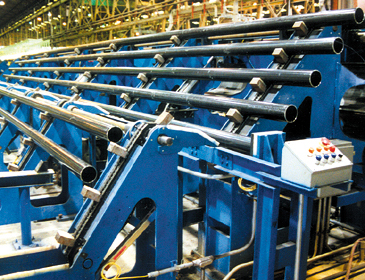 The Braner/Loopco Tube Bundler is an automated handling system designed to accept welded tubing from a mill and automatically package that tubing into a neat hex, square, or rectangular bundles with minimal effort and manpower. The Bundler separates the tubes, squares the ends, counts and accumulates bundle rows, rejects defective parts, constructs the bundle, dumps tramp coolant fluid, straps the bundle, records the weight, and parks the finished tube bundle awaiting shipment. This is automatically accomplished with few people and no man handling while the mill runs at full speed. State-of-the-art microprocessor technology, utilized to synchronize and control the equipment, allow attendants with minimal experience to program and operate the entire system. This is automatically accomplished with few people and no man handling while the mill runs at full speed. State-of-the-art microprocessor technology, utilized to synchronize and control the equipment, allow attendants with minimal experience to program and operate the entire system. User-friendly interactive touch screen monitors make system programming and operation simple and quick while line diagnostics continuously scan all system functions for proper operation and alerts and identifies any system faults. A telephone modem allows system de-bugging and operating system program upgrades to be conducted instantly by factory technicians. 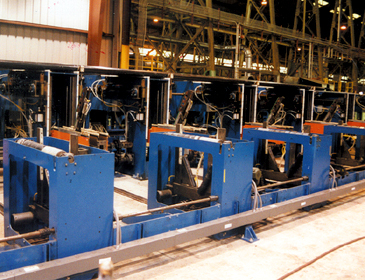 Braner/Loopco Tube Bundlers are all "custom tailored" to meet the unique demands and specifications of a specific tube producing installation. As a result, Braner/Loopco Bundlers are available in any level of automation and sophistication required to satisfy a specific production level, and in any arrangement necessary to suit available space. 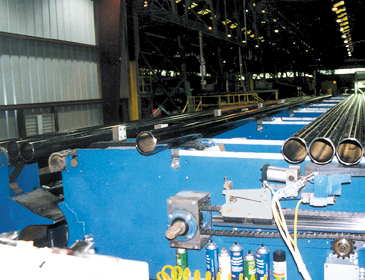 Braner/Loopco Tube Bundlers are custom designed and manufactured in modern facility in Schiller Park, IL, by experienced designers and engineers and skilled craftsmen. An experienced technical staff handles customer service and support from this location near O'Hare airport, a location that greatly facilitates responsive service. If you would like additional information on Automatic Tube Bundlers, Tube Mill Entry Equipment, quick-change "Turret" Tube Mills, and high production coil slitting lines, please phone, fax, or e mail us.